Today's love story starts with a virtual meeting online and ends in matrimonial bliss! Brinder and Nicole met on a popular online dating website and have been inseparable ever since! 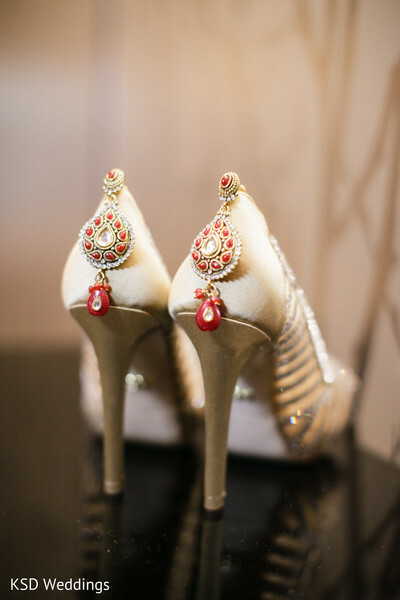 Highly acclaimed photographers and cinematographers KSD Weddings gives us a sneak peek at the graceful bride getting ready for her Indian fusion wedding at the Springfield Country Club in Pennsylvania! 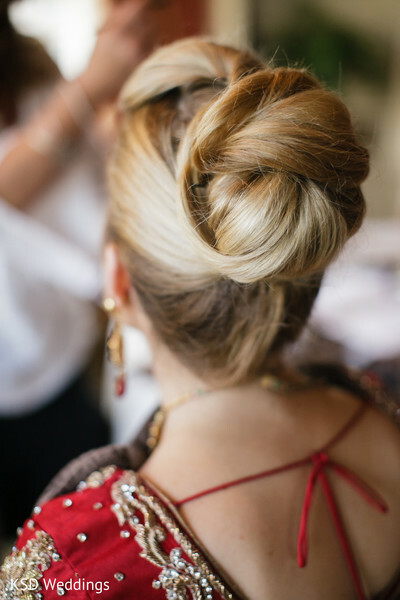 Hair and makeup artists from Salon l’Etoile & Spa style our Maharani's golden locks into an elegant updo, with subtle eye shadows and bright red lips. The dark liner in her water-line really brings out her sparkling blue eyes! 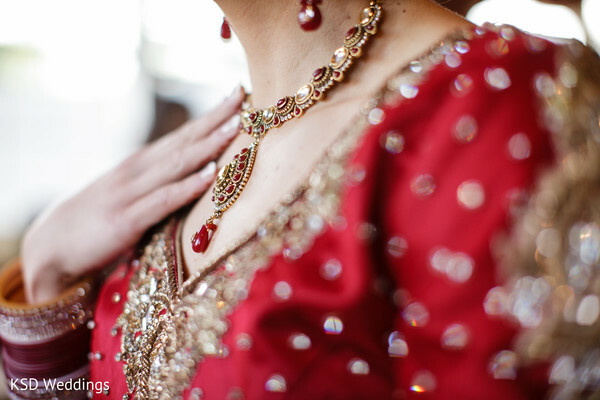 She looks regal in gold and ruby jewels which are the perfect complement to her A-line cut lengha which her mother-in-law picked out from India! 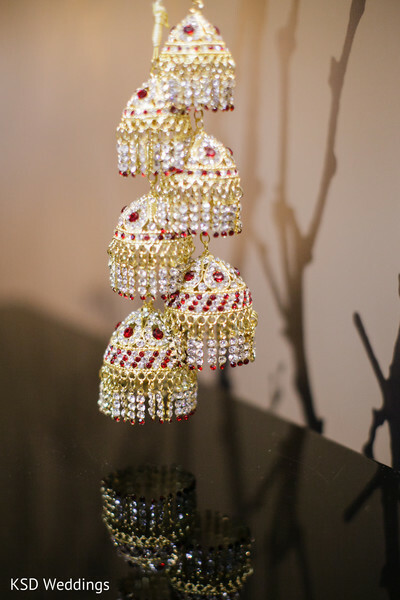 I know you are at the edge of your seats waiting to see how Abhishek Decorators designed the mandap, but while you wait, browse the gallery for more beauty tips! "Brinder and I met on eHarmony. We often joke with Brinder's parents, a successful arranged marriage, that eHarmony was very similar to a traditional matchmaker by matching us based on personality traits. Shortly into our relationship, I knew Brinder was the one not only because I could completely be myself with him, but because he also took so much time and effort simply to spend time with me, to listen to me talk of my day, and to support me in life's ups and downs." "Brinder created a magical proposal. On a trip to visit my family in Virginia, he decided that we should spend one night in Washington D.C. On our first night there, we planned to go out to dinner, and to my surprise, a hired car was there to take us - it was "more convenient" he said. As the car drove, we approached the Potomac harbor where there were rows of enormous yachts. Curiously, we stopped in front of one named "Finished Business," and I was told we would be dining on the yacht. On board, there was an individual playing live music from a repertoire of my favorite songs, my favorite flowers, sunflowers, were all around and there was a bar stocked with my favorite champagne. Once we began our journey on the Potomac, the sun began to set, and Brinder suggested that we go out on the deck of the ship. He pointed to something in the horizon to divert my attention and when I turned around, he was down on one knee. He had even hired a photographer who was secretly taking pictures of the whole thing, and when we went back in the cabin, the musician was playing our song. We danced and toasted to our love and then had a fabulous meal. It was a truly magical evening." 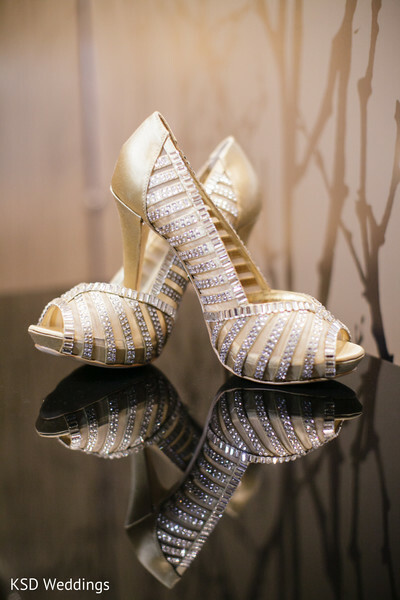 "While I had a style in mind for both the ceremony and reception, I went through a trial run with my stylist to create the perfect look. The morning reception consisted of an elaborate updo with rich colors for my makeup to compliment my lengha. In the evening, my hair was softer and more romantic, with a softer makeup palette in order to reflect the tone of the evening's decor as well as my evening wedding dress." 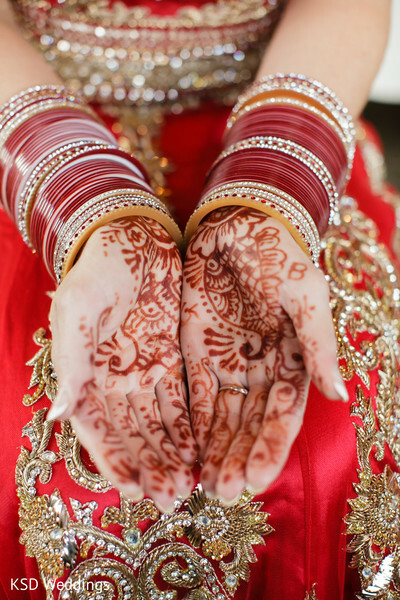 "I credit the choice of my wedding lengha exclusively to my mother-in-law. Prior to her traveling to India, we went shopping in the States to get an idea of style. I knew I wanted something with elaborate beading along with a deeper red color with gold accents and an A-line fit. While I was originally meant to travel to India with my mother-in-law to shop for my wedding outfit, law school prevented me from making the trip. Luckily, my mother-in-law seems to know my style perfectly. She sent me pictures and Facetimed with me to show me something she had found, and I knew instantly that it was perfect. 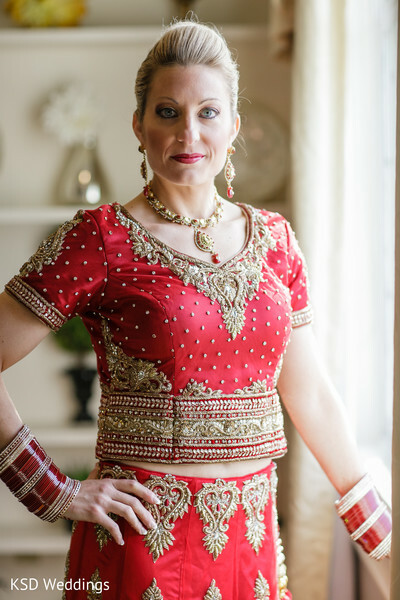 She somehow knew exactly what I wanted, and aside from a few minor adjustments for fit, she wound up picking my perfect wedding lengha." "The set I received from my in-laws is truly worth mentioning. Consisting of over ten carats of diamonds in a white gold setting, it is jaw-dropping and one of the most cherished pieces I own (next to my wedding ring of course!)." The first look portraits and ceremony are next! Springfield Country Club is a member of the Platinum Guide. Love what you see? Explore their portfolios.